A pair of Chiricahua leopard frogs are released into the wild. The pair were among 454 frogs released into the Clifton Ranger District to bolster populations of the threatened species. 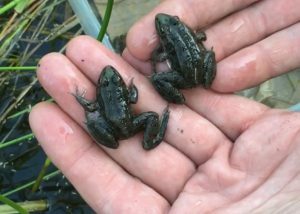 PHOENIX — Chiricahua leopard frogs received extra help getting the hop on avoiding extinction after 454 of the threatened species were recently released into restored habitat on the Clifton Ranger District on the Apache-Sitgreaves National Forest. The young frogs were released under a partnership between the Arizona Game and Fish Department (AGFD), Arizona Center for Nature Conservation (ACNC) – Phoenix Zoo, U.S. Fish and Wildlife Service (USFWS), Bureau of Land Management New Mexico (BLM), U.S. Forest Service (USFS), USDA Agricultural Research Service Jornada Experimental Range (JER), Turner Endangered Species Fund and the New Mexico Game and Fish Department (NMGFD). In May, AZGFD biologists, in coordination with the BLM, USFWS, USFS and NMGFD, transported leopard frog egg masses from one of Turner Enterprises’ ranches in south central N.M. and the BLM rearing facility in Las Cruces, N.M. to the ACNC – Phoenix Zoo. The zoo head-started the egg masses, which involves raising tadpoles from the collected egg masses in a predator-free environment, so that the juveniles can be released into the wild. The eggs produced tadpoles and ultimately hundreds of the small threatened frogs. During the September release, AZGFD biologists placed juvenile the frogs into restored habitats on the Clifton Ranger District and more are expected to be released in spring to provide an additional boost to the wild populations. Over the years ACNC – Phoenix Zoo has provided more than 24,000 juvenile frogs and late-stage tadpoles for release into the wild in Arizona. This conservation story is a direct result of all of the partnerships involved over the years. The efforts are part of an established recovery plan for Chiricahua leopard frogs, which are native to Arizona, New Mexico and Mexico.